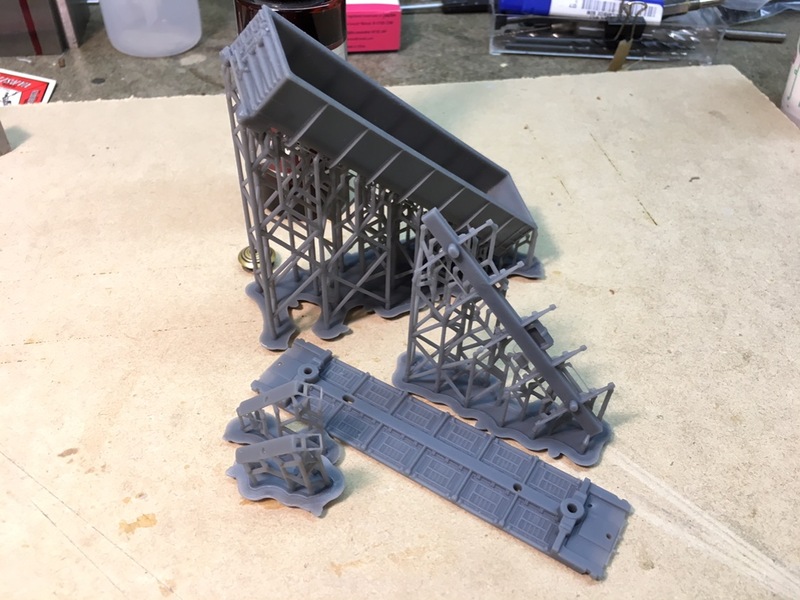 I borrowed a friends Form Labs 3d printer a few weeks ago to make some parts for work and was able to steal some time to print out a TT G50 Drop Bottom Gondola. If all goes well I plan on buying one of these for my home use and get serious about producing kits of something. Anyway here is the first shot and it came out much better than expected. At high resolution the surface looks to only need a little clean up before I can put this into RTV and case some. The lower rod detail is not going to work out so that will require a re-design that allows the fitting of a brass rod from behind to simulate the printed area...this will make it look a lot cleaner. Now that the last of the kids is out on their own, I may have time and energy to actually produce a kit. I have re-visited the SP caboose and working toward a printed underframe-rear platform casting to replace the laser cut version. Anyway, here is the first stab, it took 15 hours at high resolution, obviously not a good way to produce models, but for patterns, very cool. Very nice! Who made the 3D design? Looks Great Joe! Glad you're back! Wow that looks really good. Any idea what model the printer is? What people think: "liberals/conservatives are ruining my country"
ConducTTor wrote: Wow that looks really good. Any idea what model the printer is? It was done on a Form Labs printer. Amazing out put, easy to use. As I noted before not much for production given the time it takes to print (15 hours) but it gives you great patterns to work with. The material is a liquid and it's printed using UV at 100 Microns. The rotating bars at the bottom didn't work out due to the supports, but I have made a work around so that goes away and small notches are molded behind the braces to accept a brass rod. I'm cleaning the parts now and giving the metal surface a weathered, slightly banged up look. Seems you've got an unusually high quality 3d printer there. I now have a Formlabs 2 with larger capacity and much better resolution and will run this on that machine to see if I get better quality. I had a few rough spots first go around but I think I figured out a way to make it better.